The Hanson House Foundation is a non-profit corporation that provides lodging and other supportive services in a ‘home like” environment for families and loved ones of critically ill or injured patients in the greater Palm Springs area. Hanson House was created to provide accommodations for those individuals who have a critically ill or injured loved one in the hospital. Accommodations are generally for the period of time when the patient is critical and once the patient becomes stabilized alternative arrangements are discussed with the guest and a check out date established. Guests at Hanson House (the “House”) must be family members or caregivers of patients receiving hospital inpatient care, or outpatient therapeutic care. Lodging is restricted to immediate family members or those who are directly involved with the care of the patient. The House serves all who need it regardless of religious belief, race, or economic status. For everyone’s protection, guests who have infectious diseases cannot be admitted. Those acquiring infectious illnesses during their stay will be asked to leave. Infections including, but not limited to: chicken pox, shingles, measles, hepatitis A, or tuberculosis will be asked to relocate for lodging. Guests must be able to take care of themselves. If a guest has limitations, a caregiver for that individual must also be registered as a guest. Confidentiality regarding guests and/or patients’ personal information, (including medical status) must be maintained at all times. Initial referrals must be from a physician, clinical manager, social worker or chaplain. The referral form is generated from one of the aforelisted individuals and is faxed to Hanson House, attention Executive Director. The Executive Director will review the referral and discuss availability of accommodations with the primary contact on the referral form. Return guests may be accepted by the Executive Director without hospital referral. House stays are not to extend beyond the period of hospital based treatment or observation. Guests will typically be limited to 4-5 days and continued stay will be based on demand and recommendation by the physician and care team, in consultation with the Social Worker and the Executive Director of the House. Guests must limit their absence to one night or relinquish their rooms. Minor-aged children (17 years of age or under) must be accompanied by a parent or legal guardian. This policy does not apply to minors who are emancipated by virtue of marriage or judicial determination (proof may be required by the Executive Director of this status). The Executive Director has the right to limit the number of guests to a room, or deny acceptance to families who have previously abused House privileges. Guest rooms consist of two queen-sized beds and can accommodate no more than four (4) individuals. The guest must be able to take care of him/herself. Welcome to Hanson House. We are pleased to offer this “Home away from Home” to you during this time of special need. Everyone staying in Hanson House must be properly registered before they can stay overnight. Registration takes place daily between 8 a.m. and 8 p.m. There is a room limit of 4 persons per room and one room per family. At the time of check-in, you may not have been able to complete all of the information requested, therefore, please keep the House staff informed as your situation changes – – especially where you can be reached in an emergency, and any major changes in the medical condition of you or your family. In the event of an emergency, guests should dial 911. The need for rooms at Hanson House regularly exceeds the available space. Therefore, if you leave the House for more than one night, we will ask that you give up your room for another family on our waiting list. Guests may come and go at will; however we try to have the Front Desk staffed by volunteers from 8 a.m. to 8 p.m. daily. Upon arrival, you will be given access key to your guest room as well as for your food locker in the kitchen. Keep your guest room door locked when you are not in your room. Hanson House is not responsible for anything left in your room. Do not open doors to anyone you don’t know – get a staff member or volunteer to come to the door. Guests are permitted to have friends and family members visit them at Hanson House. All visitors must abide by the rules and policies of the House. Visiting hours are from 8 a.m. to 8 p.m. Visitors are requested to stay in the common areas of the House so as to keep guest room area quiet and serene. Smoking: The use of any smoking materials, (including vapor cigarettes) is not allowed anywhere in the House (guest rooms and common areas). Smoking is only allowed in designated areas and all smoking materials must be disposed of in the proper containers. Alcoholic Beverages: There is to be no alcoholic beverages consumed on the premises except for specifically sanctioned functions. Illegal Drugs: There is to be no use of illegal drugs on the premises. Only physician prescribed controlled drugs may be permitted. Weapons: There are to be no weapons on the premises at any time. No babysitting services are provided. Children are to be supervised by their parents or legal guardian at all times. No child under the age of 17 may be left unattended at any time. Parents are expected to clean up after their children and are responsible for any damage. There is an entertainment cabinet in the Living Room with a television, DVD, and VCR for the guests use. In addition, there is a computer and printer in the Living Room to afford access to send and receive email and write letters. Guests are requested to use the consensus method to determine what shows or entertainment programs are desired by the majority of guests. The Hanson House is a volunteer project. When you are a guest here, you are a volunteer. As a guest, you are expected to keep your room clean and leave your room as you found it. You are asked to clean up after yourself in the kitchen and laundry room. There is a housekeeper daily to assist in keeping the common areas clean and inviting. All eating and drinking must be done in the kitchen, dining room, or outdoor patios only. We ask that you refrain from eating and drinking in the guest rooms. Special permission can be obtained from the Executive Director to take food to the guest room of a person too ill to leave the room. Only people officially residing at the House are allowed to use the kitchen area. Guests are welcome in the dining areas, not the kitchen. Please be sure to have each new guest read all rules and information. Keep refrigerators in order and please clean out your section before you check out. The refrigerators are cleaned out every weekend, and all unmarked items are discarded. A lockable cupboard will be designated with your guest room number for your food. Freezer items should be labeled with your last name and casita number before placing into freezers. All unlabeled items not in a labeled basket will be removed from the freezer. Freezer doors should not be held open for prolonged periods of time. Please dispose of soiled diapers in the proper receptacle. Plastic garbage bags are available in the laundry room for disposal of garbage. Soiled diapers are to be placed in plastic bags and placed in outdoor garbage containers only. There is a no-cost laundry room available for guest use. Laundry detergent is available in the laundry room. Please empty lint filters in dryers after each use. Please put your dirty linens in the soiled linen containers in the laundry room before you check out. There is a telephone in each guest room for incoming calls and for local calls. All long distance calls must be with the use of credit card, calling card, or collect. Pay phones are available in the front lobby of the main hospital building. There are numerous garden areas for quiet reflection and solitude. In addition, there is a chapel/meditation room available at the front of the building. We ask that children using these areas be accompanied by an adult. Quiet hours are in effect from 10 p.m. to 8 a.m. This includes all areas inside the House. Please be considerate of other families. Please turn down entertainment equipment, keep voices lowered, close doors quietly, do not launder noisy items such as jeans and tennis shoes, etc. Any children not in bed should be resting quietly with their parents. When your children are awake in the morning, please be sure they play quietly so that those guests who have had a long night at the hospital can get some rest. Children up early in the morning MUST be accompanied by their parents in the common areas, including outdoor gardens. Animals are not allowed on the property except Seeing Eye and other service dogs. Please maintain a neat and decent attire. Nightwear should not be worn outside your guest room. Whenever you are not in your bedroom, shirt and shoes are required. 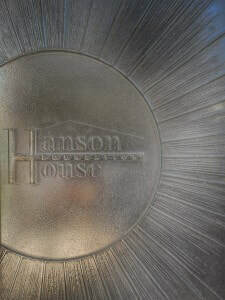 Hanson House is designated for guests who are able to take care of their own personal needs. If you are unable to care for yourself, you must provide your own caregiver. In the event of a medical emergency, contact 911 immediately. When leaving your guest room, or any other unoccupied area, please turn off air conditioning, fans, television, radio, lights, kitchen appliances, etc. Help us keep our utility bills down and conserve energy. The Dining Room is a place for conversation, games, and visiting, as well as an eating area. Please do your best to keep it clean, comfortable and inviting. A library is maintained in the Living Room for your use. Feel free to take a book that you are reading with you. Please report any damage or accidents promptly and directly to the Front Desk or the Executive Director. Hanson House has a limited number of parking spaces. Space is limited to one car per family. Please park in designated slots. Please familiarize yourself and your family members with the fire exit plan as soon as you check in. Each room is a self-contained unit, so in the event of fire if it is not your guest room, remain in your room until fire personnel come to your rescue. If the fire is in your room, close windows and evacuate the room closing the door behind you. Hanson House staff and volunteers do not give out information about guests. If you wish to maintain friendship with other guests, you must exchange names and addresses, etc. before you leave. Guests who violate any of the written House Rules or policies and procedures will be asked to leave the House immediately. In certain instances, an individual or family will not be allowed to use the House in the future if behavior during the stay has been unsatisfactory. We thank you in advance for your adherence to these House Rules.